Lincoln Square and its neighbor Ravenswood, which define themselves as “two neighborhoods, one community,” are like a small town in the heart of the big city. 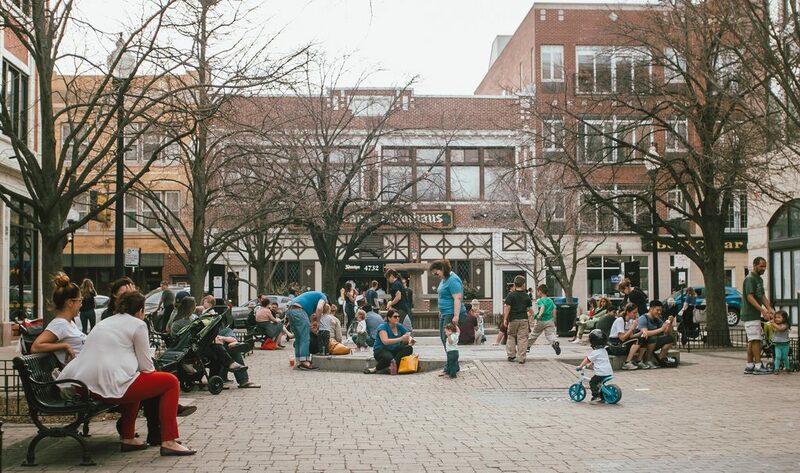 Together, Ravenswood and Lincoln Square are home to flourishing local businesses, long-held community ties, and amenities and events that bring residents together. Whether you’re moving to Lincoln Square or moving to Ravenswood, you’ll be settling into a historic and walkable area centered on a classic town square. As your Lincoln Square movers, we’ll help you settle in there. Just over 10,000 people live in the Lincoln Square, with an equal balance of gender. Residents have a median age in their late 30s. Many people are married or live in multi-person households. Roughly a third of households have children. While many adults have Bachelor’s degrees, the neighborhood features a range of educational levels. The Lincoln Square area was settled mainly by German farmers in the 1840s, and developed through the decades as it became known for its produce and flowers. Ravenswood gained its identity as a residential community in the early 1900s, as the whole area took on modern features. Community leaders worked to maintain Lincoln Square’s heritage throughout the 20th century, so the neighborhood still has a classic European feel and a flair for produce festivals today. Now you’ve got the gist, here are some highlights—and basics—we found to help you start your best Lincoln Square life. Welles Park: Indoor and outdoor recreation facilities, community programs. Winnemac Park: 40 acres of facilities, programs for students. Closer to Ravenswood. Giddings Plaza: Concerts in summer. Farmers’ Market: Twice a week, October through June. DANK Haus: German American Cultural Center, exhibits and events. Lillstreet Arts Center: Classes and programs for all ages. Davis Theater: Movie theater with in-house dining and bar. The Book Cellar: Independent. Serves wine. Urban Pooch: Accessories, daycare, and play space for the dog in your life. Lincoln Square Chamber of Commerce: Community events and resources. Pizza: Borelli’s. Has arcade. Delivers. Japanese: Miku Sushi. Rolls, ramen and more. Delivers. Vietnamese: LC Pho. Family-owned. Delivers via GrubHub. German: Chicago Brauhaus. 40 years of beer, dancing, and family-friendly atmosphere. French: Bistro Campagne. Neighborhood gathering place with sustainable focus. Mexican: Garcia’s Restaurant. Patio, margaritas, and fresh ingredients. Southern USA: Luella’s Southern Kitchen. Classics with global influence. BYOB. Northern USA: Monti’s. Philly cheesesteaks and more, plus full bar. Farm to Table: Fork. Gastropub famous for brunch options. Fine Dining: Two great “indy” options. Cocktails: The Sixth. Unique drinks, artistic presentation. Wine: Ampersand Wine Bar. Patio, serves food. Beer: Huettenbar. Euro and American brews on tap. No food. Irish: The Grafton Pub. Whiskey, beer, food and live music. English: The Red Lion. Pub with events and international game watches. Entertainment: Carbon Arc Bar. High-end options to sip inside Davis Theater. Family: Rockwell’s Neighborhood Grill. Kid-friendly by day, adult “merriment” by night. Mariano’s: Full grocery, prepared food. Ravenswood. Tony’s Finer Foods. Local, full-service chain. Starbucks. A few close by. Groundswell Coffee Roasters. Roastery serves drinks and sandwiches. Two locations. The Perfect Cup. Bright, cozy space. No longer cash only. Spoken Cafe. Open mornings and afternoons. Ravenswood. Coffee Slasticarna Drina. Bosnian coffee, desserts, and lunches. Lincoln Square Athletic Club. Equipment, pool, classes and other amenities. LA Fitness. Equipment, pool, classes and child care. Orangetheory Fitness. Group fitness sessions. This has been a tiny sampling of the great things you’ll experience at your new Lincoln Square home. As a seasoned Lincoln Square moving company, we’ve learned all about the staples and cool places in the area. We’re happy to share more! As you’re planning your big move, cross one major thing off your to-do list, and book Lincoln Square movers who’ll a take load of stress off your mind. Call us at New City Moving, and we’ll help you move safely, smoothly, and on-schedule, so you can settle right in and start living your greatest Lincoln Square life.